Neo-Pure HDFB High Density Bag Filters are made in the USA of the highest quality materials to offer the best quality and efficiency available. The filters are standard #2 size bags to fit most major housing brands, but also offer an additional 637 cubic inches of depth filtration. 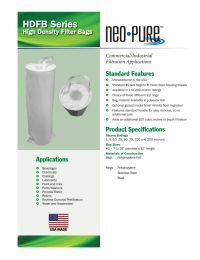 HDFB filter bags feature a standard handle for easy filter removal at no additional cost.